I am really enjoying the work the Bensons are doing on Green Arrow. Citizen makes for an interesting villain, keeping the social conscience element of the book at the forefront, and making Oliver Queen (as opposed to Green Arrow) the target of the villain keeps life increasingly difficult for the guy. Green Arrow is one of those few characters who, in the comics at least, is more interesting in his normal life than in costume. His 1 percenter background, and the way he struggles against it, while at the same time using it to fund his crime fighting, makes his internal struggles captivating, when handled by a decent writer. Citizen is the perfect villain to highlight his own quandaries. I also really enjoy the art on this book. Javier Fernandez provides some very dramatic action sequences, but also excels at making the people all look very real. Black Canary does not come off as a Barbie doll, but a realistically attractive woman. 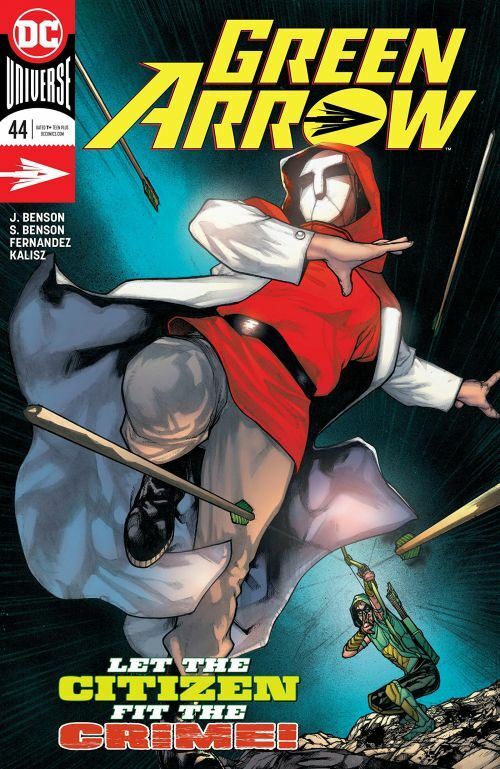 Most of the comics that I enjoyed from this week’s releases culminated in some shocking reveal, or guest appearance, on the final pages, and Green Arrow fits that pattern. I won’t say who shows up, but it was not expected. A very good story, well told, with dynamic and engaging art.